There is only one (leader) who stands out in history as worthy of our worship. His name is Jesus. Worthy of Worship is an uplifting look at several critical elements of true worship. 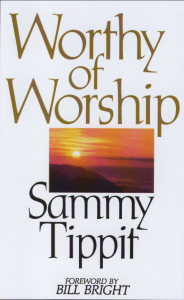 Tippit offers practical help and encouragement for personal revival, discerning and removing false gods, and worshiping in spirit and in truth. He also discusses the relationships between worship and suffering, prayer, and witnessing. Tippit cautions Christians not to glorify worship, but to glorify the One who is worthy of our worship – Jesus. He is the focus. Without an understanding of who Jesus is and what He has done for us, true worship is not possible. To purchase Worthy of Worship, go HERE! !.